Yes, I admit it. This year’s Olympics have drawn me in more than any other since I was a child. From cringing at unsportsmanlike controversies even before the Games have begun to getting caught up in the thrilling rush watching the down-to-earth teen’s fulfillment of a childhood dreams, I have definitely been emotionally invested in London 2012. Yet it was during a televised newscast last night that I was alerted to arguably the most intriguing Olympic story about the South African runner Oscar Pistorius who speeds past opponents in prosthetic legs. I have been eager to see him race ever since I became aware of him a few weeks ago—the technically “disabled” runner has incredibly impressive speed. He will be the first amputee athlete to ever compete at the Olympics. Yet apparently there has been great debate over whether he should be disqualified over his prosthetic running legs giving him an unfair advantage. Pistorius was born without fibulas, one of the long bones in the lower leg, and he had both of his legs amputated below the knee just before the age of 1. As he grew up, he didn’t let these physical challenges slow him down as he played cricket and soccer and later, rugby. After an injury from rugby, he took up running. Now 25, Pistorius runs with Össur’s Flex-Foot Cheetah prosthetic legs, which are now the standard for many of the top Paralympic runners. While racing in the Paralympics circuit, his “running blades” raised no such dispute. In 2004, nine months after taking up the sport, he was representing South Africa at the Paralympics in Athens. In the semi-finals, he broke the world record. Afterward, he began running against able-bodied athletes in the 200-meters and 400-meters races. Controversy arose in 2007 when Germans reported that Pistorius expended 25 percent less energy than runners without prosthetics. The International Association of Athletics Federations (IAAF) banned Pistorius from competing after the release of the German report. “If it was such a technologically advanced piece of equipment that many of the people …claim it is, then why isn’t everybody running close to the times I’m running on it,” Pistorius said at a London Olympic press conference. After the December 2007 ban, Pistorius hired a lawyer who gathered a team of scientists at Rice University to measure his leg movements, the forces he exerted on the ground, his endurance and oxygen endurance. They also analyzed his leg-repositioning time, or the time it takes for him to swing his leg from the back to front. The study deemed Pistorius “physiologically similar, but mechanically different” from runners without prosthetic legs. In 2008, the Court of Arbitration for Sport (CAS) in Switzerland revoked the IAAF’s decision and gave him permission to compete. Largely due to the delays caused by the controversy, he missed qualifying for the 2008 Beijing Olympics by 0.75 seconds in the 400M. 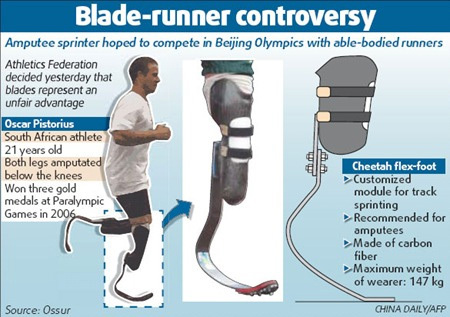 While he won the court battle to run against able-bodied athletes, scientists jumped into the fray to argue that Pistorius’s racing prosthetic and lighter weight from having no lower legs give him an edge over the other runners. Experts say the struggle of the 400M is during the second half when a runner’s lower leg gets weak, slowing them down. Pistorius’s prosthesis naturally doesn’t get tired, giving him an unfair advantage say some. Others argue that his leg-repositioning time is unnaturally fast because his lower leg weighs less than half that of his rivals. One scientist says Pistorius’s lighter prosthesis means must push harder to get the same force against the ground; another argues he doesn’t have to push as hard to run just as fast. Jill McNitt-Gray, a researcher at the University of Southern California says that even the most elite sprinters have their own running styles. Some rely more on their hips, others on their arm thrust. An amputee finds his own best way to use his prosthetic. According to Rodger Kram, a biomechanics expert who was part of the team to study Pistorius at SMU, athletes should only be in different races when motors or alternate power sources are introduced. 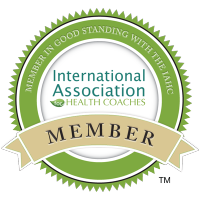 A former competitive athlete and sprinter, I can appreciate and honor the level of commitment, endless hours of hard work and the incredible amount of effort it takes to be an Olympic-caliber athlete. I can only imagine the sheer determination it must take to go against these hurdles—and people questioning every meter of the way–while on prosthetic limbs. From my living room couch, my heart will be full as I cheer for Pistorius as he faces his competition in the 400M race and the 4x400M relay. I am very familiar with the issues concerning prosthetics and sports. Unfair advantage? I don’t think so. Bravo Pistorius!!! !